Organization is something many people strive for, but few of us actually manage to attain. When you’re juggling tons of plans, people, and priorities in your life, it can be easy to feel like you’ve just got too much to worry about and can’t stop to refocus. Instead of letting yourself feel overwhelmed, try to implement some habits in your life that will help you with your organizational skills. 1 – Wake up early. If your disorganization stems from simply not having enough time in the day, waking up even a few minutes before the rest of the family to tackle one or two tasks can be huge. By getting ahead and finding your focus before you’re thrown into the chaos of the day, you’ll be better positioned to navigate your schedule in an organized and thoughtful way. 2 – Keep a schedule. Getting into the habit of tracking your plans and writing them down can be tough to start, but you’ll always know exactly where you need to be, and you’ll have a helpful place to take down notes and other reminders. 3 – Follow routines. Routines can be a tremendous help in keeping us organized. By going through the same motions in the same order as you prepare for your morning or get ready for bed, you’re able to move through those tasks without expending as much energy or brainpower, and you’ll be virtually guaranteed to get them done. 4 – Set reminders and alarms. If you’re good at making schedules for yourself but aren’t so great at actually remembering to look at them, consider using your phone’s built-in reminder system or installing an app to help you out. Since you probably carry your phone with you at all times, it’s an easy way to stay on top of tasks and ultimately be a more organized person. 5 – Track your budget. Staying organized financially can be tough, but it’s important to know where your money is going and to stay on top of critical expenses and bills. Building the habit of creating and following a budget is an easy and effective way to help you keep your finances organized. 6 – Follow the one-touch rule. If your disorganization shows itself in the clutter around your home, this can be a real lifesaver. When you pick up an item in your home, whether it’s the TV remote, a roll of paper towels, or a pair of socks, tell yourself you’re only going to put it down once. What does this mean? You’ll need to put it back where it actually belongs instead of dropping it off on the kitchen counter, dining room table, or other clutter-collecting spot in your home. 7 – Declutter often. In addition to making sure things stay where they belong in your home, it’s equally important to make sure you don’t become overwhelmed by the sheer amount of stuff in your life. Staying organized can be impossible when you have too much clutter, so it’s a good idea to purge things you no longer want or need on a regular basis. 8 – Keep your inbox clean. If you’re one of millions who has made the move to electronic billing, your inbox has likely replaced your physical mailbox as the place you go for important messages and updates. However, if you struggle to keep your inbox clear of clutter, spam, and messages you simply no longer need, you’ll have a tough time. Dedicate time each day to deleting and archiving unneeded emails. 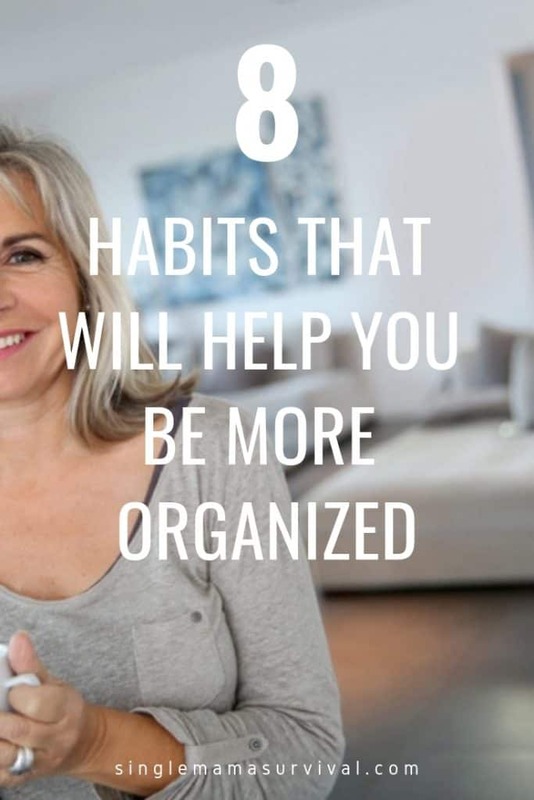 From keeping a schedule to keeping your inbox as close to zero unread emails as possible, there are plenty of habits you can embrace to become a more organized person. Which habits do you think you’d benefit from the most? Leave a comment and let me know!